Thursday was a busy evening for me. I had the pleasure of attending two separate events. The first of which, was a French event called the “Irréductible Gaulois”, hosted by Thierry Gabadou from U.F.E., and held at ISTP’s Cohn Campus. It was really an interesting gathering of self-made French ex-pats. Everyone was showing off their businesses or skills — and what I really appreciated is listening to everyone’s stories. Everyone was so proud to show how “indestructible” they are, how they “made it” after moving here. Trust me, it’s hard, coming to America from a different country, and still maintaining your sense of cultural identity as well as succeeding in your career and life. Our language immersion school does a good job with our French immersion and chinese immersion programs — we teach appreciation of culture and the idea of internationalism. I’m proud that ISTP teaches our own students to be “indestructible” themselves. On the topic of internationalism, I heard a wonderful word last night at the second event, a reading at Kepler’s Book store. The word was “internationalist.” It came from author, and former ISTP trustee, Nancy Keeney Forster. She wrote a wonderful memoir about her late husband Cliff, who was a Foreign Service Officer. The book contained both her own observations and memories, as well as records and papers from Cliff, on the topic of their numerous international adventures across the span of 60 years. 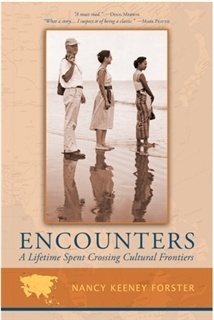 The book, “Encounters: A Lifetime Spent Crossing Cultural Frontiers” is an excellent example of why it’s important to educate our children to be “internationalists” - to be internationally aware, to understand other cultures, and to have the capacity to bridge barriers.